When I tried to consider how to describe Beekeeping to folks who have never been beekeepers, it took me a while to decide how to start. Beekeeping is VERY simple, and Beekeeping is very complex.. After a little consideration, I decided that beekeeping is best compared to ART..
HOW on earth would you describe something as complex, far reaching and diverse as ART, so that anyone could understand it? 1. the expression or application of human creative skill and imagination, typically in a visual form such as painting or sculpture, producing works to be appreciated primarily for their beauty or emotional power: "the art of the Renaissance"
2. (the arts) the various branches of creative activity, such as painting, music, literature, and dance: "the visual arts"
So, art seems pretty complex, and indeed it can be, Visions of the paintings in the Sistine Chapel by Michelangelo between 1508 and 1512 come to mind, or, The painting of the Last Supper by Leonardo da Vinci that covers the back wall of the dining hall at the monastery of Santa Maria delle Grazie in Milan. BUT by the same definition, a small childs drawing for his/her mother, posted on a refrigerator, IS Art..
Refrigerator art cant really compare to the Mona Lisa ( Also by Leonardo da Vinci) Except, that by definition, those crayon drawings are very much ART. Beekeeping is VERY much the same. Like Art, beekeeping has its level of complexities. You can keep bees in a simple basic manner all the days of your life, but if you so choose, you can delve just as deeply as you wish. There is always something to learn, and that is part of the draw for those who are never satisfied with the basics. The beauty of beekeeping is that you CAN tailor it to suit your own comfort level. 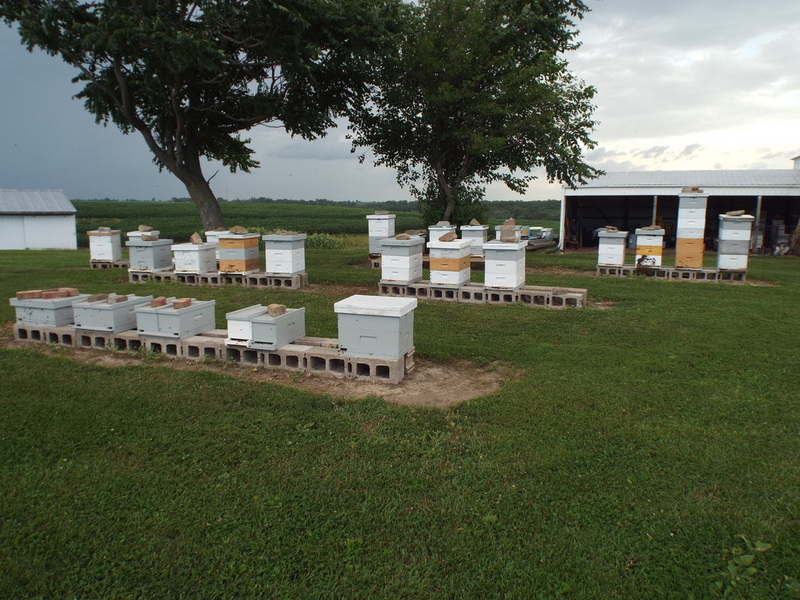 The hard part is bypassing the information overload, AND keeping your bees alive that first year. This is what I am attempting to get across with this website. the basics that will keep your bees alive. I ask, that you put aside some of the grand ideas and plans for a short time, and set yourself up to succeed. Wait for your second or third year to begin trying new things. Set aside the desire to go all natural, or to go treatment free, or to NOT feed, etc, and KEEP your bees alive that first year. It is my goal to aid you in that process. It is easy to become confused. Take a step back. Take a deep breath, and read my getting started page. If that is confusing to you, then PLEASE join the World Wide Beekeeping Forum and ask your questions. WE WILL insure you understand. We WILL help you! These pages are a work in progress. There will constantly be new updates, pictures, videos, and information. With each passing year I hope to make the things presented here more informative, and enjoyable. Please check in often! Can be a hobby, a lifestyle, and even a business. Each beekeeper has his own methods, his own plans, and his own ideas. Differing methods, hive types, climates, ideas, and even the type of bees being kept can make instructing someone just starting out difficult. Because of all the differences, there is no such thing as an instruction sheet. There are too many variables. In the following pages, I will show you how "I" do things. How I do it, does not make it right for you! But, it is a start! We all started somewhere, and we all made, and WILL make mistakes! I will break down the variables into a basic method that will help you keep your bees alive. Beekeeping is addictive, enjoyable, relaxing, and heartbreaking. Each in their own time and place. There are many different styles of Beehives. Top bar, Long Hives, Natural hives, Observation hives, and Langstroth hives among the types of removable frame hives. Most non removable frame hives are not legal to use in the states. Skeps, logs, clay pots etc. I use the Langstroth Beehive. Stating that does not give perfect clarification. Some people use eight frame boxes. Some use ten frame boxes. Some even use five frame boxes. Some use 10 frame boxes with nine or eleven frames in them. Then there are box sizes. Deeps, mediums, and shallows. Deeps are commonly used for brood boxes, and mediums or shallows are used for the honey supers. Personally, I use all medium ten frame boxes for the versatility. Three medium boxes equal two deep boxes. Deeps are 9 5/8 deep, mediums are 6 5/8 deep. To add to the confusion, the frames you can use in those boxes also differ to a certain extent. Mostly in the foundation used. Plastic foundation, wax foundation, or foundation-less. I have some of each, but am phasing out most of the plastic, and will eventually use up the wax foundation, as I favor the foundation-less, allowing the bees to decide what they want to build. Confused? Wait! There are also different cell sizes on the foundation. Large and small cell! 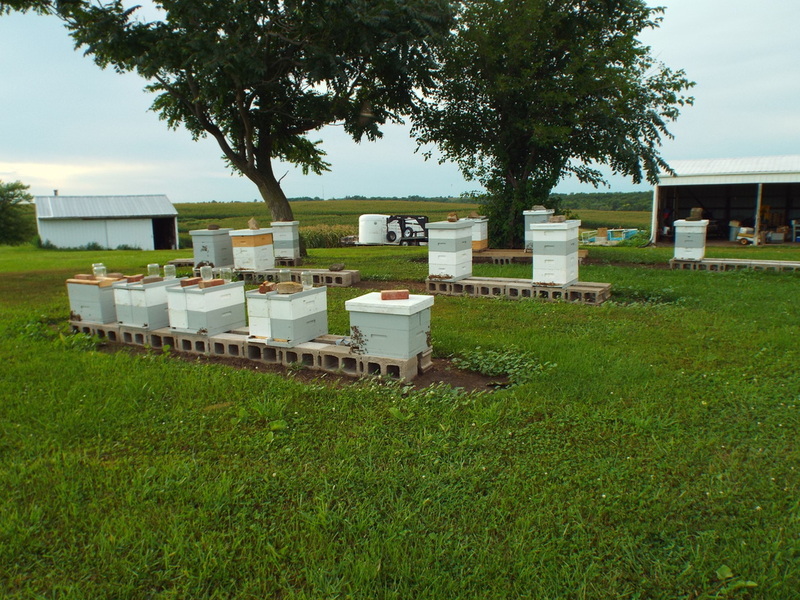 The different hive types, the different box sizes, the different cell sizes, Different frame types and the different foundation types, each have advantages and disadvantages. I'm not one to argue over those things. Experienced beekeepers do like to argue about little differences in their methods and strategies. None of that is relevant to a new beekeeper. Keeping your bees alive the first year or two IS! I know a great beekeeper who lives over in NY State. He uses poly hives with NO upper ventilation. His philosophy is that heat rises, by removing the upper ventilation the bees can retain some of that heat in those poly hives. I have tried it, I lost two hives, nearly lost the other three. WAY too much moisture in the hive. BUT, it DOES WORK where he lives! I know it works there, or he would not have live bees in the spring. So, what is different? Hive material? Elevation? Bees? I cant answer that, but what I can say, is that the method I use to overwinter WITH upper ventilation in a standard pine box, wrapped with tar paper is used clear across the US and even up into Canada and Alaska. It is a BASIC method of wintering bees. I think in some locations it can be improved upon, but the BASIC premise is that it should work where you live if you have COLD winters. Cold = three months of 20 degrees F or colder. Cold does not mean it gets to freezing (32 degrees F) for two weeks and then its 45 degrees again. In a situation like that, I am told the method I use still works, but I have never kept bees below the 41st Parallel, so use caution. What I advocate is to start beekeeping with the Basics that are known to work. The methods I advocate are not fringe methods, but methods that have been used for a long time by a vast majority of beekeepers in the US. Methods that will have the best chance to keep your bees alive. Build your confidence and knowledge, learn a method that works before you begin to try different things. This will make it easier to modify your methods to suit your own style and ideas. GET your bees through the first winter, THEN work on figuring out what works best for you in your situation and climate. What YOUR methods will be, and then continue to advance, modify and change from there. This way also has the benefit of allowing you to understand why a different method did not work if your bees die. The one saddest thing about beekeeping, is that every beekeeper has to learn his own methods from scratch. He, or she, WILL lose bees and hives while trying those fancy new gimmicks and tricks. I am not immune, I have tried the newest and greatest things, and I have lost bees. In the end, I usually return to the basics that I know work. The one thing I will emphasize here is that you need to contact beekeepers close to where you live, and learn what works for them. Always try to consider the advice and suggestions, but try to temper what you hear. I know a beekeeper that advocates ALL natural beekeeping, he specifically states that you should NEVER feed your bees or treat them for mites or diseases.. If you do that, the chance of your bees dying jumps up to around 95% so some caution is advised. Join a CLUB, and attend the meetings, and ask questions! Find a good forum, and ask questions there! Nothing is set in stone. If you decide to use plastic frames because they are easier to handle and work with, you can always slowly convert over to foundation-less or wax foundation at a later time, so your not making a life altering decision. Make a choice and START, then begin to modify to suit your own situation. The folks at http://www.worldwidebeekeeping.com Will help keep you on the right path. You will find there is a bit less political pandering and arguing. Give it a try! Hope to chat with you there! Copy and paste in your browser bar or click the button at the top right to go straight to the forum! "if a man is alone in the woods, and speaks and no woman is there to hear him. is he still wrong? "barry42001 WWB Forum"
Early Spring. 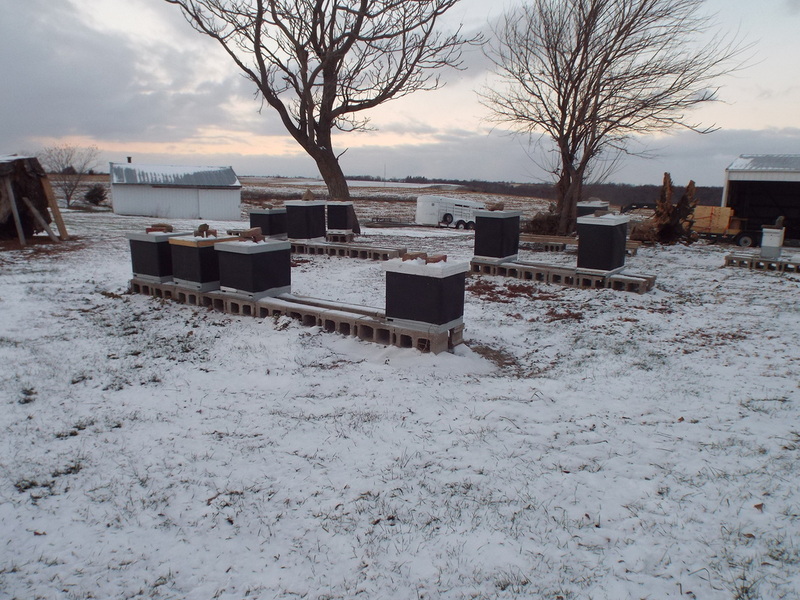 The single story hives are NEW, and only two nucs have bees in them.. Mid spring.. 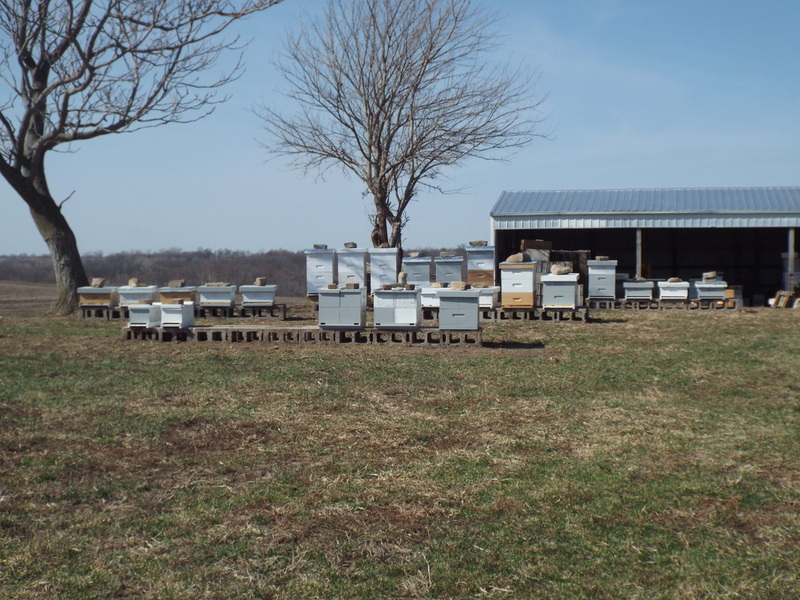 Older hives moved to outyards, new splits started in nucs, older splits moved to hives. Mid July.. Couple more hives moved, some ready to move, some too heavy to move! All nucs full and building up to overwinter, and there's a storm moving in! August in the bee yard. Only 8 full size hives remain. The rest were moved to outyards as they reached production size. The ten nucs are FULL of home grown queens and half of them are being actively managed to keep them whittled down to "nuc" size. 4 hives across the pond in front of the house still puts me at 22 hives in the home yard. So still have 4 or five to get moved. GREAT fall looks to be upcoming! Above are pictures of the main yard and two outyards as we near the end of October. The big stump is a rather large colony of bees. It is too late in the year for me to attempt to cut them out, so I am going to try to get them through winter where they are. Winter is here. All but a few of my hives are wrapped and prepared as best they can be. I still have a couple nucs to move and wrap and 4 production hives to move and wrap. I think this is going to be a long hard winter. It is only the middle of November and the winds are blowing 25 mph and the temp is 5 degrees, so that means the wind chill is approximately -17 as I type this.. Already the 2014/2015 winter is shaping up to match or exceed the 2013/2014 winter. It didnt actually arrive until February. March is now here, there is still snow on the ground, but it looks like the temps are about to start climbing. Spring is about to arrive in the bee yard! "Physicist Neils Bohr once quipped, An expert is a person who has made all the mistakes that can be made in a very narrow field. This definition clearly excludes me from being any sort of expert, since I exuberantly continue to make new mistakes in my own beekeeping adventures." Before you embark in beekeeping, try to understand, that mistakes will be made. Once you accept that, learning from those mistakes will be easier.